Spot silver continues to follows its more illustrious cousin gold by surging ever higher and extending last week’s gains once again with further positive sentiment in silver trading today. Last week’s silver trading was characterised by five straight days of gains and should we see a close higher once again today then this will make it 7 in a row for the industrial metal. 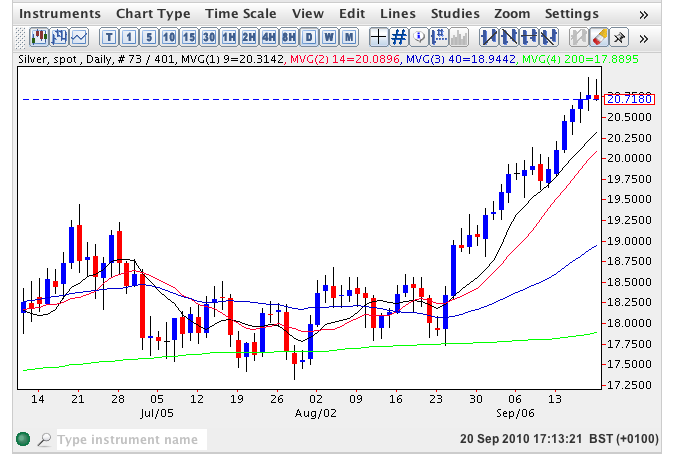 This bullish momentum was initiated by the strong break out of late August giving us a strong trading signal as a result which has duly been confirmed, coupled with strong support from both the 9 and 14 day moving averages as a result. As such we are now approaching our secondary target of $21 per ounce and provided we see a break above $21.34 per ounce, the high for spot silver in March 2008, then we can expect to see the rally continue as spot silver breaks out and extends the bullish rally further. The positive momentum for silver is given a further boost by the current risk on appetite from investors whilst also benefiting from the pull through effect of the spot gold price.